At the end of 2015, I moved back home to the Washington DC from Portsmouth, Virginia. While I was packing I realized that I had TOO many things. Too many unworn items of makeup, shoes, and mostly…too many pieces of clothing. As I packed up all my things I was extremely overwhelmed by the amount of clothes and shoes that I had. Clothes in the closet, the drawer, under my bed, in my car trunk, and in my storage unit. Some of the items were things I wore once, things that I bought just because, and things that I was just too lazy to send back. I realized then that I wanted to strive for a life of minimalism. I just had way too many things and I wanted to try to eliminate as much junk inside of my home as I was trying to eliminate within myself. I could have just given a mass amount of my clothes away to the Good Will or Salvation Army, but I didnt want my clothes being added to a mound of clothes that is sent overseas to pile up on the side of the road somewhere (this is actually toxic to locals). So I decided that I was going to sell as many items as I could on Poshmark. 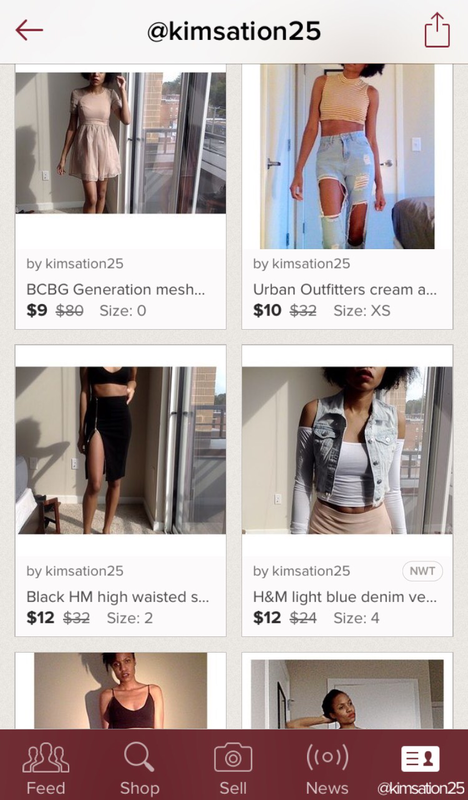 Poshmark is an app that allows you to take pictures of your clothes, write a description about it, set the price that you want for the item, and sell it. I also decide to stop buying so many clothes. We all have our vices. We all have the things that make us feel better, mine has always been buying things. Having a new outfit that someone could compliment me on was one of the things that made me feel better when I was down. Obviously this is not the best tactic in searching for peace and comfort so I decided to enforce a spending freeze on myself unless I absolutely needed it.This has been the hardest thing, but this past year I have been doing really well sticking to this plan! The last thing that I decided to do was start wearing my old clothes again. You know how it is, we wear something for a season, discard it and never pick it back up again. Well this is something that I decided to stop doing. I have decided to start wearing my clothes until they run down and must be thrown away rather than just replacing it with a newer version just because. I cant tell you how satisfying it was for me to start back wearing an old shirt that I had purchased in 2011, and wearing it until the sleeve tore. I know this sounds super janky BUT if all of us began buying clothes only when we really needed them just think of how much money we would save a year. Now that 2017 is approaching I am hoping that I can continue my journey to minimalism and eliminating the unnecessary out of my life. I am hoping that all of this will assist me in decreasing my materialistic ways and continue down the path of financial freedom, gratitude, and appreciation.